Come out to Ocean Beach today at Noon Friday March 14th and see Freddie Price, Joshua Brody perform at the rededication of the City of SF’s DogHead. Our 3 Dogs will be there for their last viewing before the Big Makeover. Bay Area prankster John Law will have his three Doggie Diner heads on a trailer at the event. 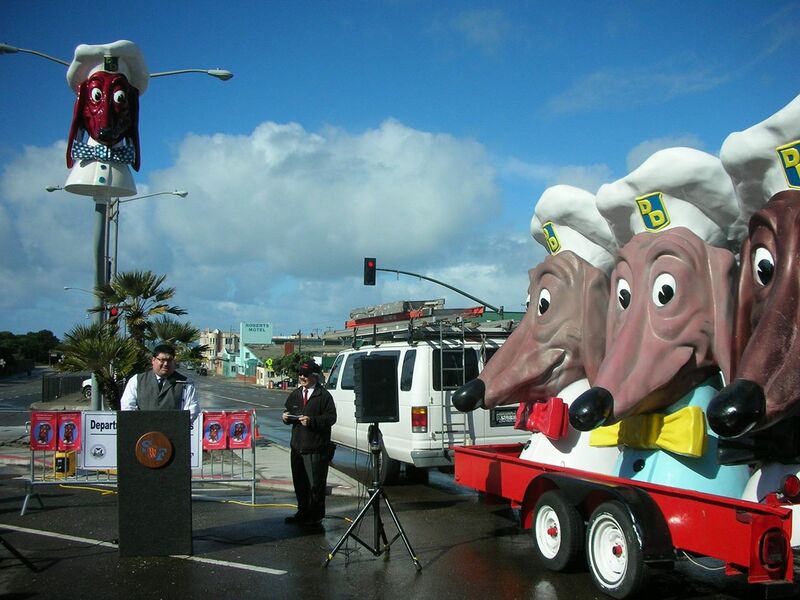 City crews (Public Works steamfitters and General Services’ Central Shops automotive painter) involved in the project to refresh the Doggie Diner head. The old sign was last restored nearly a decade ago after a wind-storm toppled the fiberglass roadside sign from its perch in the Outer Sunset, smashing its snout. The recent face-lift included: repair a hole made by a lone bullet shot through the chef’s hat; a good scrub down with soapy water and a stiff brush to get rid of mold, mildew and other that built up over the years standing in the salt air and fog at Sloat and 45th Ave.; fresh automotive paint to replace the worn, sun-faded paint; and at least four coats of a heavy-duty clear-coat finish. One automotive painter from Central Shops worked on the project. Steamfitters from Public Works removed and returned the Doggie Diner head from the pole it sits atop, and built a special phalange that held the head in place for its trip across town. 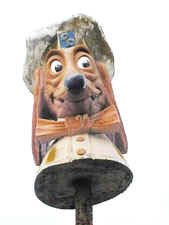 The three-dimensional Doggie Diner head, festooned in a natty chef’s hat and polka-dotted tie, was designed by graphic artist Harold Bachman in 1966. It once served as the mascot of the now-defunct Doggie Diner local fast-food chain. For decades, the sign stood outside the last operating Doggie Diner (and later the Carousel restaurant) at 46th Avenue and Sloat Boulevard. After the eatery closed and the Doggie Diner head was threatened with demolition, the community and preservationists waged a campaign to save it. The then-Board of Supervisors passed a resolution in 2000 authorizing Public Works to take over the Doggie Diner head for preservation and relocation. But months later, in April 2001, a 45-mph windstorm knocked it down, smashing the long nose for which dachshunds are known. The Doggie Diner head was restored, and a new home was found atop a pole on a public median just east of its original location. It was welcomed to its new setting with a community celebration on Valentine’s Day 2005, with then-Public Works Director Ed Lee playing host. February 14 is Valentine’s Day, and the lovingly-cared for Doggie Diner figure is a lasting gift of love to the City. This entry was posted in Uncategorized on February 14, 2014 by kevin. This Project will only be funded if we raise all of the $48k by Sat, Feb 8th, 3:00pm EST. Find Us by going to the Kickstarter website and typing “doggie diner” into the search box, or visit us directly by typing this link into your browser:bit.ly/DDmakeover Consider donating as little as $1 to help us keep this vestige of the city’s past from fading away like old photographs. If you’d like more information about the Doggie Diner Restoration Project, or to schedule an interview with John Law please email jlaw@central-services.org or send him a tweet @johnwlaw. Kickstarter campaign page: http://www.kickstarter.com/projects/2118888480/doggie-diner-makeover?ref=search A collection of high resolution photos can be downloaded by clicking here. Unless otherwise noted, all photo attribution should go to: Scott Beale/Laughing Squid. This entry was posted in write up on January 3, 2014 by kevin. That threatens to evict him from his home on Sloat. Like the fiberglass dachshund aloft in the sky. Should not be allowed to vanish like Playland. Brightening the sky ’round the zoo when it’s foggy. This entry was posted in write up on January 8, 2014 by kevin. For tenants in San Francisco (over 2/3 of us rent), it is cat city, owing to the paucity of green open spaces. Dog owners are an embattled minority. Their animals’ soil coat every square inch of grass, making lawn play a dangerous pastime. Even so, perhaps inevitably: Dogs are the objects of worship, and contention- both as living beings, and as kitsch icon. There remains one darling dachshund-on-stick where it was left behind on Ocean Beach by the defunct Doggie Diner chain. (Other Doggie Diner heads are in private hands.) Atop a rusted pole at the corner of 46th Ave. and Sloat is the sole surviving shill on location since 1965. Doggie Diners were among the first of their kind in the years following WWII. The chain was based in Oakland. In its hey day, thirty outlets served up hotdogs and hamburgers around the greater Bay Area. No visit to the zoo or Playland-at-the-Beach was complete without a stop at the DD. I never had the pleasure of eating there in its original incarnation, but the successor Carousel Restaurant is a reasonable facsimile. For patrons today, it provides the same inexpensive comfort food without frills or pretension. An unlikely combination of local history buffs, carnivore nostalgists, and humorous icon-worshippers have mounted a campaign to save this Dog on location, now that the land is owned by the Sloat Garden Center, which is interested in further developing its property. 100 or so supporters turned out on a rainy Sunday to rally in support of the Dog. “If this were the last Starbucks, we’d fight to preserve that,” said author Gil Bates, whose filmscript Dogalypse Now is forthcoming from Modem Times Press. Bates’ luncheon companion paused over a chile dog to reflect. “Not since Bummer & Lazarus-those canine sidekicks of Emperor Norton-has there been such an outpouring of affection for a San Francisco mascot,” said San Francisco history buff Ford Henry. Perhaps the Dog sign is just one more bit of 20th century detritus waiting to be replaced by its Y2K dot commie equivalent. In response to the threat of removal supporters of the Dog and civic history have lobbied for landmark status to be conferred on this totemic mutt. At a follow-up meeting next Tuesday, February 29, supporters of the Dog hope the Supervisors get the message to let this sleepless Dog remain on its post with diner intact. The alternative, they dread, is that both will be removed and replaced either with a parking lot, or condos. Again, I never got to Playland-at-the-Beach, but I see only too clearly the condos that replaced it. There’s no doubt in my mind which I would prefer see on trips to the beach. Not everyone’s nostalgia is linked to the passion of carnivores for dead meat in a tacky grease-pit. Many who missed the Doggie Diner’s sanguine offerings (the last one closed in 1986) see in the Dog the Ideal Animal: well-dressed, happy, eager to attend to soul needs as it once did one’s flesh-eating appetite. The sign of the Dog has become part of the genius loci of its Ocean Beach neighborhood. To separate the two would be to let that much more the City go-to the lower case dogs. This Dog could be the best friend we’ll ever have, so why mess with it? As Marcelle Clements has observed, in a book bearing this title, The Dog is Us. To turn our back on the Dog would be to spite ourselves, allowing another much-loved relic of our living past slip into the memory hole. This entry was posted in Uncategorized on January 7, 2014 by kevin. HOLY TRINITY OF THE DOGMINICAN ORDER! The spiritual influence of the Dog Heads has only spread since being separated from their humble commercial beginnings. Bishop Joey, the High Prelate (and chief dishwasher) of The 1st Church of the Last Laugh decreed the Dog Heads official church icons in 1996. As such they make an annual visitation at the annual “St. Stupids Day Parade” the Churches High Holy day which falls on April 1st of each year. This year (2000) the event meets just before noon on April 1st at the Pointy Building downtown (The TransAmerica Pyramid). Visit Bishop Joeys website: www.saintstupid.com/for more information. These enigmatic Doggie Diner dog heads have mysterious ties to The Cacophony Society and The First Church of the Last Laugh. They are reported to have a direct affilation with PETA (People Eatn Them Animals) and have been sighted at the annual ArtCar Fest. Their primary function is as patron saints of the Dogminican Order (a cloistered and kenneled sect of the church). This holy trinity of ecclesiastical canines is rarely together in one place. Suppressed Vatican documents declare that if a quorum (13 of the original 25) of dogheads ever gathers, world peace will break out (putting the Catholics and other fattening creeds out of business for good!). This entry was posted in Uncategorized on January 3, 2014 by kevin. Please peruse our ever expanding collection of photos of any and all Doggie Diners. If you would like for us to exhibit your photos, please send your submissions to our website as an attachment file in either jpg/gif format or email us with your phone number and we will tell you where to mail your photos.